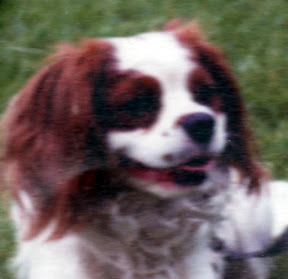 This is Daniel the Spaniel, who shared our home and our hearts for 13 years. He was a very happy dog, with very pretty face and very little brain, and he taught us a great deal about living in the moment. He never learned to let the ball rebound before trying to catch it, so was forever crashing into the back door at full tilt, but it never bothered him - he would trot back with his head high and his tail wagging. I gathered from such observation that his brain wasn’t in his skull (that was just a shock absorber) but was in the pelvis, and was air-cooled (that was why his tail never stopped wagging). It was also very small, so would overheat if too many demands were placed upon it (which was why his tail never stopped wagging). We had Daniel before our children were born, so they grew up with him. He was wonderfully patient with them - one picture I’d have loved to have, but the camera wasn’t to hand, was of our two-year-old son standing pensively beside the dog with his hand on his shoulder, like a miniature of Prince Llewelyn and his deerhound. Daniel had a heart murmur, but he didn’t know and it never stopped him; he developed arthritis in his old age, but still never stopped being a puppy until the day he went with me to the vet for the last time. That day was the first time my wife saw me cry. Daniel is still woven into the fabric of our lives, the guardian angel with the waggy tail. And when we get to the Pearly Gates, among the welcoming throng will be a little angel with a waggy tail, dancing the spaniel dance of joy which he always danced when we came home after being away. So, just for Beth to become incoherent with cuddliness and joy, we’re delighted to share our spaniel with you. Yup, that did it! Thank you Tony. My wife reminds me that Daniel already has his place on the internet, on the home page of her website at http://margaretmcallister.co.uk/ - the house is the manse we lived in when I was minister in Corbridge (Daniel died early in our second year there), and he is charactersically wagging his tail in this image. There is also a red squirrel running up and down the tree at the edge of the page - he actually happened: we called him Yo-Yo, for obvious reasons. Our headmaster in secondary school was Dr. Daniel - we used to call him Dr. Spaniel, of course! Marvellous man. He had this odd habit of murmuring your name at you if he passed you in the corridor. Like a way of saying “hi”, but perhaps also confirming that, yes, he did know who you were even though there were rather a lot of other pupils too.